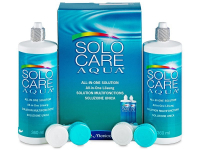 SoloCare Aqua is a multi-purpose contact lens solution designed to disinfect, clean, and store all types of soft contact lenses. This solution is suitable for sensitive eyes, and this value package contains two 360 ml bottles. Solocare Aqua is a multipurpose solution intended to clean, disinfect, moisturise, and store all types of soft contact lenses. Its efficient formula ensures clean lenses without the need for rubbing. SoloCare Aqua solution uses special, well-tolerated disinfecting ingredients, and is therefore perfectly suitable for people with sensitive eyes. This package contains two 360 ml bottles of solution and two antibacterial contact lens cases. Read more about SoloCare Aqua solution.